I purchased this Mikro-House by Sam Buxton to put in my office. 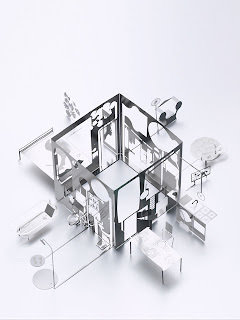 Whenever I think of a modern dollhouse, I typically think of a wood and Plexi structure, but after seeing this little masterpiece, it occurred to me that a 1:12 modern dollhouse made of steel could be quite awesome. The cost of this tiny modern dwelling is about $150. You can find it at Unica Home or other design specialty retailers.